I call these Pneuma Retreats after the greek word “pneuma”: the creative force, spirit, or soul of a person. this is a transformative deep dive into your creative well. I run an annual retreat for lady writers at the gorgeous Highlights center in Honesdale, PA. Think misty hilltops, your own little cabin, hanging out with your fellow writers, and eating some of the BEST food you will ever have in your life. We have writing workshops, lectures on craft and process, as well as meditation sessions. It. Is. Awesome. Make sure to sign up for the mailing list in order to hear when we go live on accepting attendees (limited to 20 participants) for the 2019 retreat. I also lead retreats for individual groups. Contact me if your writer's group or a group of writer friends wants to have a retreat. You set up the retreat location / food / logistics and I handle the actual retreat itself, leading and organizing workshops, meditation sessions, talks on craft and process, and whatever else you'd like! The Pneuma retreat is the best thing I have done for myself in years. Heather did a great job of making everyone feel comfortable and setting a tone of community and learning throughout the retreat. I met a fantastic group of writers who are supportive, smart, and dedicated to their craft. I really enjoyed the meditation aspect, which surprised me because it was something I had never done before--and was actually a little skeptical about. After our first meditation workshop I saw the connection to writing and have incorporated daily meditation into my writing time. Thank you so much! The Pneuma Retreat surpassed all of my expectations. 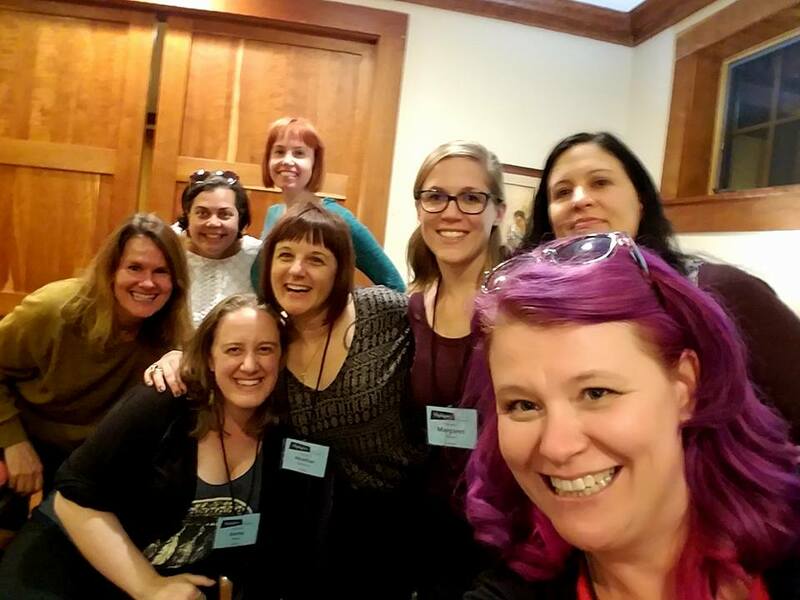 It was a wonderful opportunity to take time away from the normal whirl to really focus on my writing, develop a strategy for self-care as an artist, and get to know an incredible group of fellow writers. I was incredibly impressed not only with the instructors, Heather and Ingrid, but also the wealth of knowledge and experience of the other participants. We built a camaraderie of trust incredibly quickly (amazing food and flowing booze helped), and I foresee those relationships continuing long past the end of the retreat. I left the Pneuma Retreat feeling so inspired and creatively energized! It was amazing to spend four days with an intimate group of women, all of whom are on this same journey as me. We talked craft, marketing, industry trends, challenges, and how to stay healthy and grounded with things like meditation. My favorite parts were the evenings, when we drank wine, played games, and talked. I left the retreat with a better understanding of my current WIP, the courage to start exploring book marketing, and a lovely group of friends. I'll definitely be staying in contact with these ladies and I WILL go to another Pneuma retreat. The colours of fall, cabins in the woods a retreat just for writers with food that was abundant and that soothed the soul - especially the peanut butter cookies created the perfect cocoon for a writers retreat. Heather and Ingrid made sure that cocoon was filled with lessons, advice, tips, stories, laughter, support, feedback and kindness. The retreat exceeded all my expectations. I left feeling full of ideas, with information on how to support myself as a writer, how to develop my craft, be creative, with a long list of books to read, a network of supporters and a belief (for the first time) that I am a writer. I’m so grateful that had the courage to attend this retreat and got the opportunity to learn and grow as a person and meet such inspiring writers who all opened up their hearts and shared their own writing journey. The Pneuma Retreat was the perfect blend of inspiration, learning, reflection, and work. Heather and Ingrid were a wealth of knowledge and offered informative craft lessons each day. The topic of revision couldn’t have come at a better time; I loved that we had the chance to send in work, receive feedback, and complete one revision ahead of time. I came home with a clear plan of where to go next with my manuscript. The workshop time with fellow attendees was incredibly in depth, supportive and helpful. The daily meditations offered us quiet as well as an opportunity to disconnect. Heather answered all my ‘how-to’ questions and taught us different ways to meditate. I loved that both Heather and Ingrid were not only available for one-on-one consultations, but were so enthusiastic to talk about our works-in-progress at length. Highlights itself is such an ideal location — and the food! What a treat to be so well fed and pampered for six days. The whole experience was amazing! Special thanks to Ingrid Sundberg and Annie Peirce, who contributed photos to the gallery.